In India, people with disabilities are often invisible in day-to-day life, despite numbering tens of millions. Here, the BBC's Ayeshea Perera meets the makers of Inclov, an app that is seeking to give people with disabilities more opportunities to socialise. "How many of you need alcohol to tell the truth?" The assembled crowd at Kitty Su, an upmarket nightclub in the capital Delhi, giggles nervously. But apprehensions soon vanish, and a spirited game of Truth or Dare begins, where nothing seems off the table - from confessions about browser histories to speaking in "animal sounds". Not too long after, the DJ wheels himself to his console and a mix of Bollywood and English pop music begins pumping out. Wheelchairs and crutches notwithstanding, people begin making their way to the dance floor. This is the latest instalment of "social spaces", an initiative by Inclov - standing for inclusive love - a matchmaking app created for people with disabilities, although it also has a number of people without any disabilities on its platform. For many of those assembled at Kitty Su this is their first visit to a nightclub. 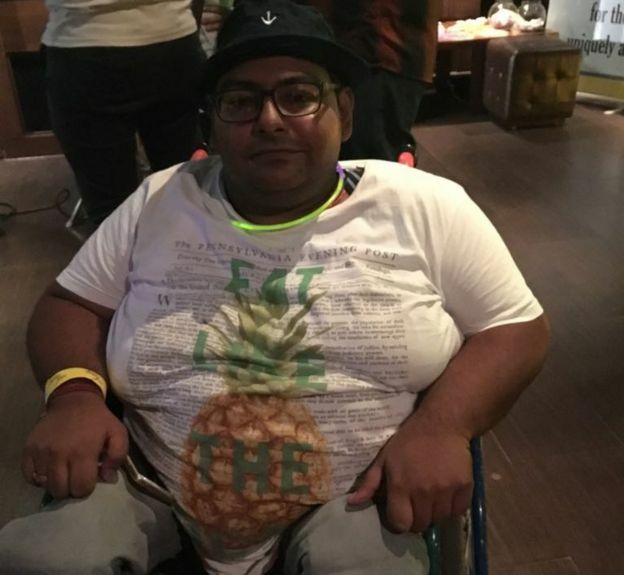 "Once I was trying to go out with my friends to a pub in Kolkata to celebrate friendship day, but they didn't let me in saying that my wheelchair would make the other guests feel uncomfortable," says Manish Raj, 34, who is by his own estimation at his "seventh or eighth" social spaces event, which he says is a much more comfortable setting. "Many Indians with disabilities have restricted social lives from the time they are kids. It's not that they don't want to go out and do things, it's just that even something as simple as getting a cup of coffee is hard for them," says Shankar Srinivasan, who co-founded Inclov with his college friend Kalyani Khona. India is notoriously disability-unfriendly, in terms of infrastructure, attitudes and policy. Many families who have children with disabilities rarely take them out in public, as it is seen as a source of stigma and shame. This "invisibility" means that they are not automatically considered a part of public life, and people often to struggle to interact with or accommodate them, meaning that many times they end up being shunned instead. 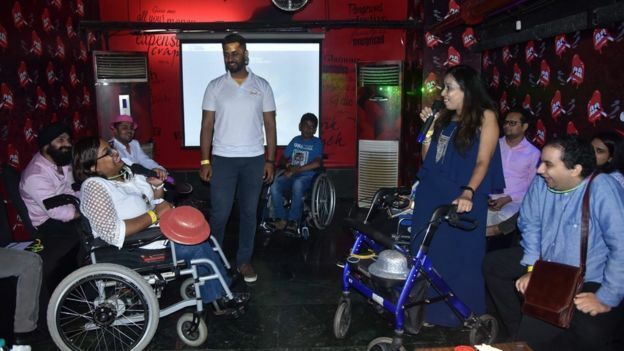 The idea for Inclov was born after Shankar and Kalyani decided they wanted to "do something in the matchmaking space" and realised very quickly that no-one was thinking about people with disabilities. They began with an "offline" agency called Wanted Umbrella which evolved into a static site and then a mobile app. "With almost 80 million people with disabilities just in India, we knew the only way to upscale was through tech," Mr Srinivasan says. But with no technical expertise or money, the two of them raised money through a crowdfunding campaign where they were able to raise 615,000 rupees (£6,976; $8,998) to hire an app developer. They then conducted extensive interviews with a number of people with disabilities, trying to understand exactly what it was that they wanted from an app like this. When it launched in January 2016, it began with some 100 verified profiles of people and the community began growing. But soon Mr Srinivasan said they noticed something strange. While people were connecting with each other online and conducting conversations on messaging platforms like WhatsApp, nothing was translating into face-to-face meetings. "We realised too many external factors were at play. Safety is obviously an issue. And there are other considerations like infrastructure, interpreters, stigma and so on." That was when Inclov also decided to create spaces where the people registered on its app could actually interact with each other. They had their first meet-up at a cafe in Gurgaon, a suburb of Delhi, with about five people. Since then they have carried out about 50 other events in cities across India, including Mumbai, Bangalore, Ahmedabad, Kolkata and Jaipur. The last event at Kitty Su had almost 50 people in attendance. "We try to create experiences for people, and also through these events, give them some level of access. So the next time they want to go out, they know that these places are available. They won't always need an Inclov," Mr Srinivasan says. The events all differ. They have taken place in varied venues, including hotels, cafes, beaches and even comedy clubs and karaoke bars. This has, according to the team, also helped convince establishments about the need to think about people with disabilities. 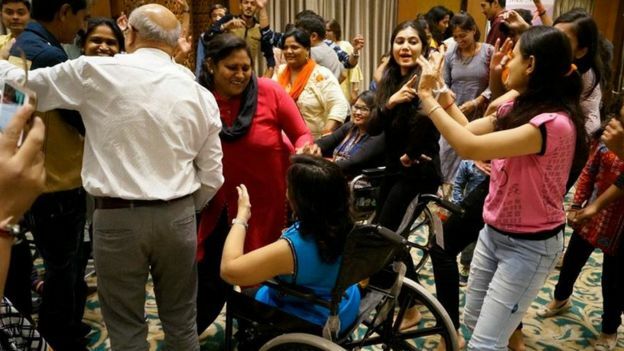 The owners of the Kitty Su nightclub - at the Lalit hotel - for instance, have made sure that all their properties across India are wheelchair accessible and have provided their staff with sensitisation training. For the most part, the members of the community say Inclov has made a difference to their lives. Kritika Bali, 27, says that although she has always been a "daredevil", she has made a lot of close friends through the app and looks forwards to the social spaces meetings. But others feel that it could do more. 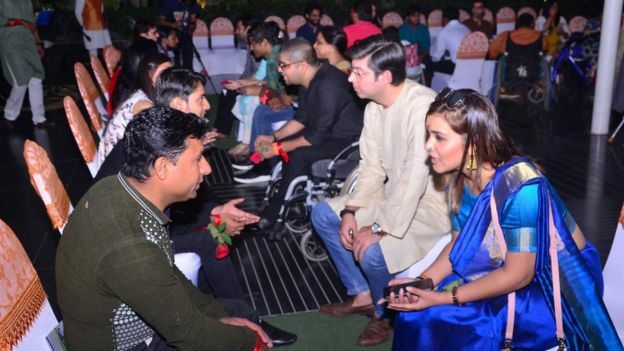 Shrey Marwah, 26, says he feels that while the socialising is "fine", the community could be mobilised into doing more about addressing issues faced by disabled people. He also said he felt that the app did not accommodate disabled people from lower income communities. "Inclov in its current form is quite limited. It should also do more to connect disabled people like us with normal people. When I walk for instance, people look at me like I'm something alien. We need to use this platform to do more for acceptance. Also we should use our collective contacts to do more at a policy level to improve things for disabled people." But Mr Srinivasan says he is quite clear that he does not want Inclov to be a space for activism. "We are more about being problem solvers rather than going against the government. It is finally the mindset of people that matters, and through our events and so on, we open up perspectives and help change mindsets," he says. Disability rights activist Nipun Malhotra says he agrees with this perspective. "This is what is disappointing about India. Why does every disabled person in this country have to be an activist? The problem with any minority in this country is that you end up being an activist because no-one else does it for you. That is what needs to change. And sometimes all we want is just to be able to meet someone for a cup of coffee."